Izabella's Tattered Letters: Artists' collaboration on Ebay for Bernie Berlin's animal rescue "A Place To Bark"
Artists' collaboration on Ebay for Bernie Berlin's animal rescue "A Place To Bark"
Gorgeous handmade/bound 4x4 chunky / chubby / fat book entitled "Don't Bug Me". Hosted by Tracie Lampe, this collaborative project features 34 artists using various collage, mixed media and drawing techniques to interpret the "buggy theme". 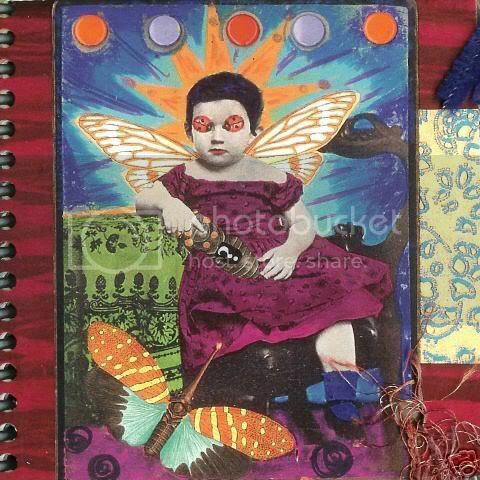 This fun and funky book is creatively bound (pages may be right side up, sideways, etc) and is embellished with fibers, beads, transparencies, and of course, plastic insects!! This is truly an interactive and festive book. Randomly selected images from the book are posted below and feature the following artists: Bailey Hill, Barbe Saint John, Bernie Berlin, Debbie Metti, Evaly Jerome, Fast Eyes, Genevieve Stephens, Laurie Giberson, and Mim Smith Faro. The pages NOT pictured are just as wonderful. You won't be disappointed in this book! Dedicated to: Bernie Berlin and her dog rescue, A Place to Bark.